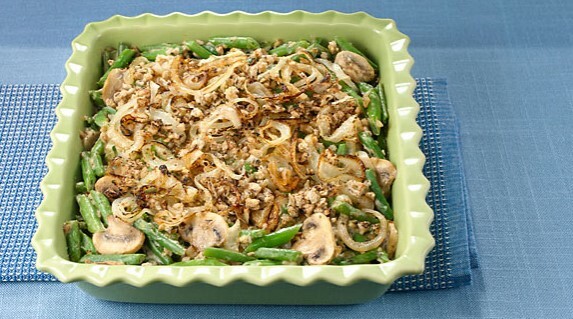 This Thanksgiving, make your green bean casserole a bit healthier, use this recipe for inspiration. Preheat the oven to 350 F. Heat a large skillet over low heat and add 2 teaspoons of oil. Add the onion slices and gently cook for 15 to 20 minutes, stirring frequently, until onions are golden. Remove the onions from the skillet and transfer to a plate. Add 1 tsp. of olive oil, the finely chopped onion and garlic to the skillet and cook for 2 to 3 minutes. Add 2 tablespoons of water and the mushrooms, cooking for an additional 5 minutes. Sprinkle flour and thyme over the vegetables and stir. Gradually stir in the skim milk. Increase heat to medium and stir constantly until the sauce thickens. To cook the beans, boil for 8 to 10 minutes in water. Or, to save time, place the green beans in a microwaveable container and add 2 tablespoons of water. Cover and microwave on high for 5 minutes. Drain and set aside. Spray a 2-quart casserole with cooking spray and place the green beans in the casserole. Pour the mushroom sauce over the green beans. Top with onions and bread crumbs. Bake in a 350 F oven for 15 minutes, until the top is golden brown.